Interactions on Facebook. Recently and over time. Recent interactions play a large role, especially if someone has recently viewed your profile page. Profile views. They have viewed your profile and/or you have viewed their profile – Total amount of views when compared to other friends profiles viewed. Tagged photos. Photos that you’ve been tagged in or have tagged your friends in. Wall posts. Has this person posted on your wall recently, or you on theirs? Likes. Have they liked your content or have you likes theirs? Comments. On your posts or comments you’ve made on your friends’ wall posts or pictures. Photos viewed. They have viewed your pictures, and/or you have viewed theirs. Currently online. Friends who are currently online or have recently been online. This typically applies for random people that might show up. Messenger. Facebook messenger conversations between each other. Mutual interactions. Between yourself and your friends will likely play a bigger role in determining who your “closer” 9 friends may be. “Close Friends.” If you’ve added friends to your “Close Friends” group, typically at least 2 of these people will be shown in the 9 friends box. It’s safe to say that if a friend’s photo is showing up on your timeline, but you haven’t had any recent Facebook interaction with them, then, yes, that person has probably been spending a hefty amount of time looking at your profile. YES – these are the people that Facebook stalk you! (to some extent). The pictures vary, but it seems like the same people are generally appearing there on a regular basis. I have always wondered why those regulars always show up – do they look at my timeline a lot, do I look at their timelines, am I tagged in photos with those people, have I messaged any of them recently? – the answer to these questions varied for each person, but these seem like the most logical reasons as to why these peoples’ profile photos always appear on my timeline. The 9 friends shown in your Facebook Timeline friends box are determined by a number of factors, but mostly they will show friends that you appear to be closer with from interactions on Facebook. These 9 friends may be your closest friends, family members, crushes, Facebook stalkers or just friends that have recently viewed your profile. While the friends box will still show some random friends every so often as well, most of the time the larger percentage of friends will be those who you are connected closer with as determined by Facebook’s friend algorithm. 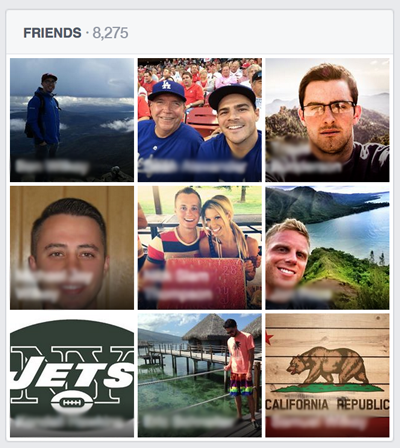 Facebook most likely takes into account whose friends profiles (and photos) you view and who your friends view. And then compares these profile views in relation to all of your friends (or in the case of your friends, what other friend profiles and photos they view more often). So if Facebook notices that one of your friends views your profile more often than their other friends’ profiles, then more than likely this friend’s picture will start showing up in your friends box, especially if you view their profile too. While these 9 friend pics do seem to change frequently, and still have around 2 random friends showing up to mix things up, overall your friends who show up in your 9 friends list box, are much more likely to be “connected” to you on some level, whether directly or indirectly, as compared to your other friends who don’t show up very often. Keep in mind, because everyone has different friends, a different number of friends and different types of relationships, everyone will have a slightly different reason as to why certain people show up in their friends box. Facebook is always tweaking its algorithm that determines these factors, so the reason why certain friends show up may always be changing slightly. But at the end of the day there are definitely a number of key factors that go into Facebook’s top secret friend algorithm that determines why certain friends photos show up in the 9 friends box at the top your Facebook timeline profile. And more than likely it’s because they are your best friends, closest friends, family members, boyfriend, girlfriend, your Facebook crushes, Facebook stalkers, and likely they are ultimately individuals that have recently interacted with you on Facebook in one way or another. We’d love to be friends! Connect with us on Facebook, Google+ and Twitter. And don’t forget to share this post with your friends!